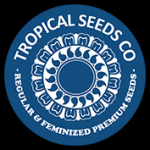 Tropical Seeds - Dandy Dance CBD Feminised Seeds. Free US delivery. Dandy Dance is a predominantly indica, CBD-rich cannabis strain with a moreish taste and a potent effect. Dandy Dance was created by crossing the Lavender Baron Dandy cut with the Dancehall Mapetit. It is an easy to grow strain which grows quickly and uniformly, making it ideal for newbie growers. During its vegetative phase it develops a sturdy main stem surrounded by a prodigious amount of side branching that produce elongated colas during the flowering period which takes 60-70 days. Although yields are merely average Dandy Dance develops a profusion of resin glands which cover compact, rocky buds. The aroma and flavour is a blend of curry, orange and lavender notes together with musky/skunky undertones. Its effect is quite intense, initially energetic before becoming more relaxing after a while. It is ideal to relax and chill out, also good at relieving aching muscles while keeping a clear head. Dandy Dance produces extremely tasty hashish concentrates.